Forsythkid: A DanO burger at the Park! Forsyth MO. - One of the great joys of camping, for me at least, involves food. Everything (well just about everything) cooked outdoors seems to taste a lot better to me! Weather: Low 70's, south winds 10-20 mph. Sunny skies. It was still early spring in southwest Missouri and while it was still a bit chilly to go tent camping, I wanted to go down to one of the area parks to try out my cooking skills on a Coleman propane stove. Armed with a plastic spatula, a fry pan and a few condiments, I planned to grill myself up a hamburger DanO style! For this very modest outdoor culinary effort, I had visited a local grocery store to pick up a package of 'pre-formed' hamburger patties (yes, I'm that lazy) along with a package of buns. 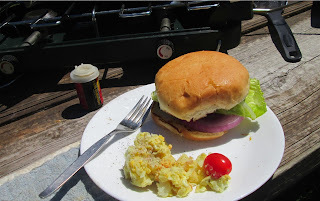 In the back of my Jeep was the aforementioned propane stove, 2 propane canisters, a very old fry pan, two hot pads, a spatula, paper towels, salt and pepper shakers, a slice of red onion, some potato salad, romaine lettuce, my special hamburger sauce and a couple of cherry tomatoes! Wow! That was certainly a lot of junk to haul around just to prepare one measly little hamburger! (But, I gotta tell ya, it was so worth it)! Setup of the Coleman stove on a picnic bench was a snap, even for me. And before I could say 'I'm really starving', I was up and running with a meat patty sizzling in the pan. I was making myself a 'patent pending' DanO Burger! And, while this burger has endured many transformations over the years, I still always find myself going back to the burger basics; good buns, great ground meat along with a few select condiments.